The SQL Continue statement is very useful to control the flow of a SQL While loop. Generally, we use this statement inside the While loop, and if the execution finds the SQL continue statement inside the While loop, it will stop executing the current loop iteration and starts the new iteration from the beginning. For example, If we have 15 statements inside the loop and we want to skip executing few statements (statement 2 — statement 6, and statement 11 — statement 14) when certain condition is True otherwise, it has to execute all the 15 statements inside the loop. In this situation we can place the SQL IF ELSE or SQL ELSE IF to check for the condition, and within the if block place the continue statement in Sql Server. If the condition is True, it will stop executing statement 2 to 6, and 11 to 14 otherwise, it will execute statements from 1 to 15. 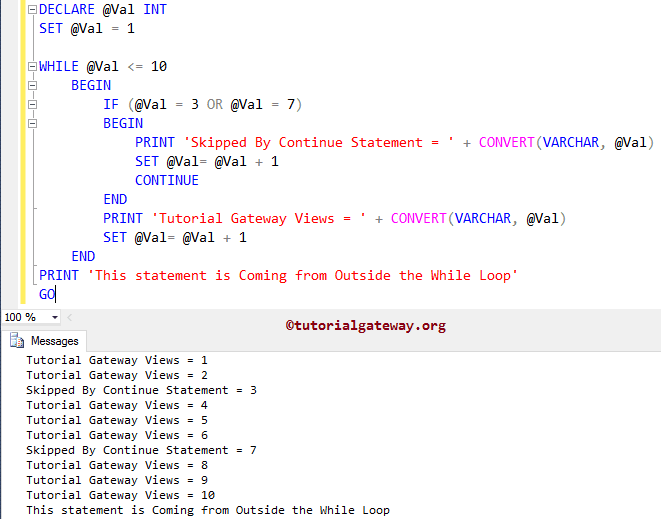 In this query, We are going to use the SQL Continue statement inside the While loop to control the loop iteration. Within the While loop, we check for the condition whether @Val is less than 10 or not. I suggest you to refer SQL While Loop article to understand the iteration process. Inside the While loop we placed SQL IF ELSE to test whether @Val is equal to 3 or 7 (IF (@Val = 3 OR @Val = 7)). If the condition is false, it will skip the SQL Continue statement and prints the following statement as output (In Our case 1, 2, 4, 5, 6, 8, 9, 10). If this condition is True, SQL Continue statement will be executed. Next, the While loop iteration will stop at that number (i.e., 3 and 7) without printing the other statements. For better understanding, we placed the below statement inside the If block. So, whenever the iteration break, that value will be printed from this statement. Following statement is outside the While Loop, and it has nothing to do with the expression in While loop. It means, irrespective of condition result, this statement will execute.